Your roof looks great on the outside, but do you know what's happening underneath? Follow these basic principles to make sure your roof is properly ventilated. You’ve selected your shingles, determined your underlayment, but have you discussed your attic ventilation system? Attic ventilation is critical to the longevity of your roof and the entire structure of your home. Yet when it comes to planning a new roof, your ventilation approach is often left in the hands of your roofing contractor. If you are in need of quick primer on proper attic ventilation – how it works, the benefits and how to get your current system inspected – you can find it here. Not convinced you need to concern yourself with ventilation? Read this tale from the field. 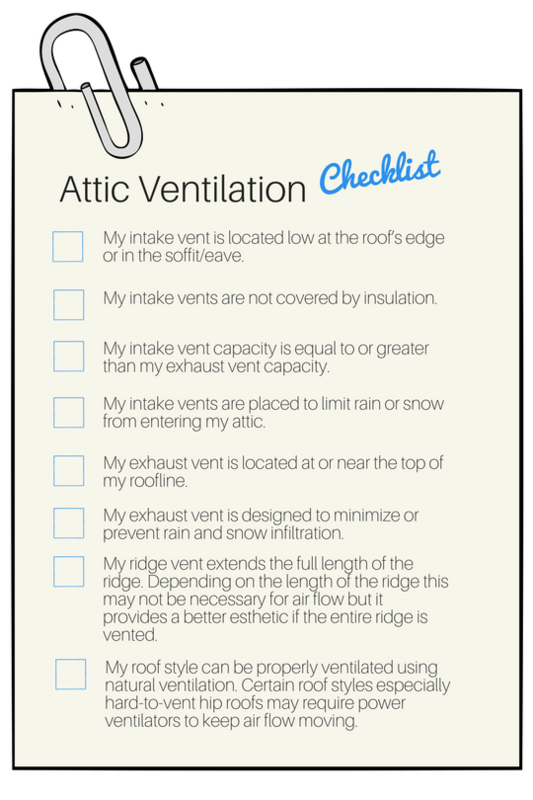 Ready to talk attic ventilation with your roofing contractor? We created you a cheat sheet. Planning a new roof? We can help you Find a Pro in your area. Plus, how to select a roof based on your weather region, and five questions you should ask before installing a solar roof (scroll down). It explains why you should use soffit vents and was very helpful! Having a regular check on your attic ventilation should be fundamental as any delay could cost you a lot of money and time. You can do it yourself by making a checklist. It could have a lot of things to look but the priority should be to look if it is moist. Humidifiers or indoor pools could be the indoor sources for it. Secondly, check for intake ventilation. There should be at least 50% ventilation provided through intake vents. However, too much intake will pressurize the attic so the ratio should not exceed more than 60% intake/40%. It’s perfect for your attic. Yes, existing gable vents should be shut. If not they will short-circuit the ventilation by diverting air flow away from the soffit vents. Should existing gable vents be shut zone 5 when installing your roof ridge vent with soffit vents?